A man was slashed at a Manhattan subway station at the height of the Tuesday evening rush, police say. 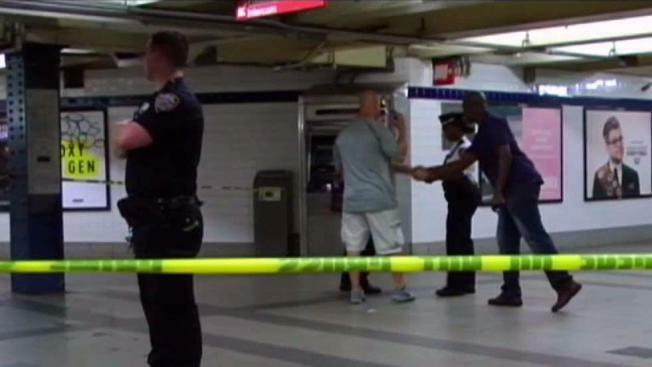 Authorities said a man stabbed another straphanger just before 5 p.m. inside the Canal Street station. The violent encounter started because of innocent contact between the two men inside the crowded subway, police said. "They bumped into each other going down the steps," NYPD Transit Assistant Chief Vincent Coogan said. That led the suspect to take out a large pen knife and slash the man on the forehead and across his wrist, police said. The victim was taken to Bellevue Hospital to be treated, officials said. However, his condition was not immediately known. "He was cut on his neck with there blood everywhere that soaked his shirt all the way down," witness Brian Karlsson said. Police were searching for a man wearing green pants, a blue hoodie and a black trench coat. Karlsson said the victim and a friend chased the suspect down the street, but the slasher got way. The slashing did not affect subway service, the MTA said. Police are looking at nearby surveillance footage as part of their investigation.